Some you win, some you lose. 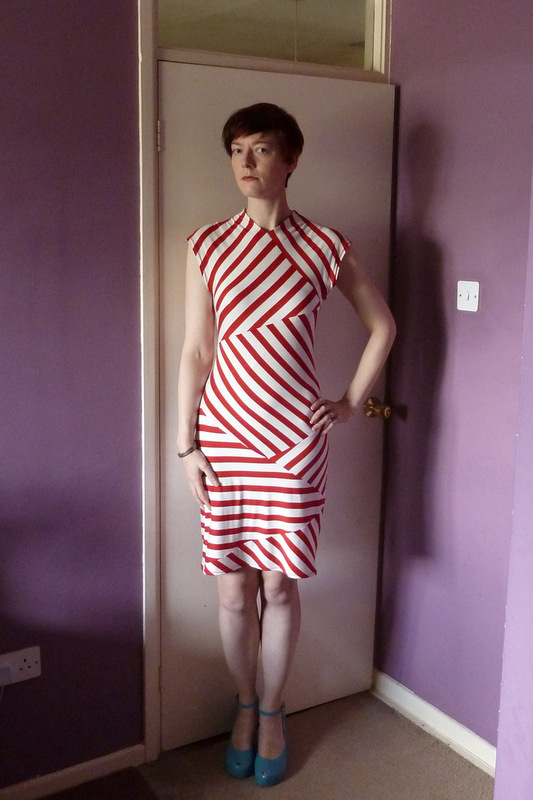 I’ve been banging on about my striped version of Burda 117-02-2012 for weeks. I finished it last week and…it just doesn’t work. Here’s the evidence. The back view’s not so bad. But the front is Wrong. I used to have a housemate who could pronounce ‘Wrong’ so that you could hear the capital letter. I can hear him saying it now about this dress. I think it’s not just the stripes though, some of it’s the fabric. The shade of red doesn’t work on me, and it’s much too lightweight and clingy. There’s a reason I am not showing you a side view of this dress even though I matched most of the stripes at the side seams. So I’m writing this off as a learning experience. I still want to make a striped version of this dress but I’m going to wait until I find a heavier striped knit. And in the meantime I’m going to trace off a pile of autumn patterns and do some serious comfort sewing. A few weeks ago SewingElle posted about a wonderful striped Anthropologie dress. It has several diagonally slanted panels on the waist and skirt with the stripes running in different directions on each panel. The effect is very eye-catching. 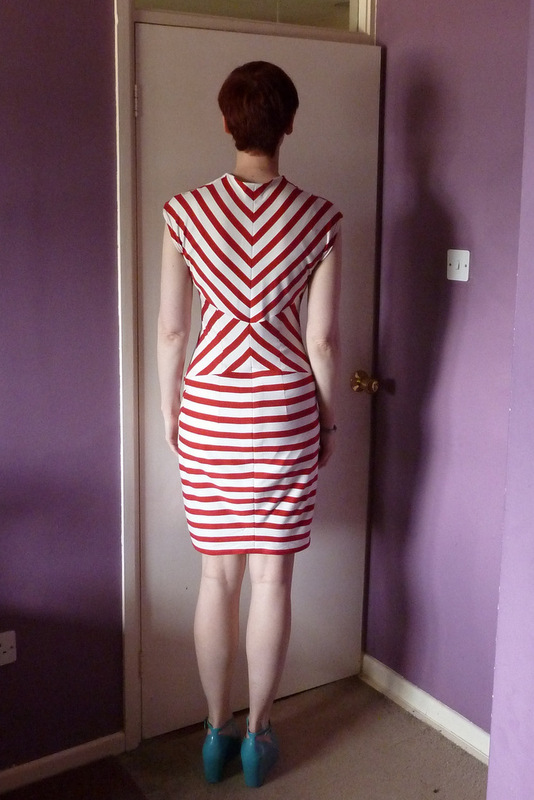 After reading her post I fell in love with it too and wondered if I could get a similar effect by making up my beloved Burda 117-02-2012 in stripy fabric. Here are the style lines of Burda 117-02-2012. The back has a strong line of mirror symmetry down the centre back seam but the front is very asymmetrical. The large triangular panel on the skirt has borders with three other areas, two of which also share a border. This means at least three directions of stripes are required if they are to change direction on every seam. I did a bit of research (well, checked all my sewing books) to find out the official line on How One Should Align Stripes. I didn’t find a lot of help in most of them, although as always Ann Ladbury’s The Dressmaker’s Dictionary had some definite opinions on the subject. Did you know that the traditional direction for diagonal stripes is from the left shoulder to the right hip? I certainly didn’t. There’s a school of thought that horizontal stripes are widening. There’s another school of thought that they are slimming. Ms Ladbury seems to prefer horizontal stripes on the whole, but says that vertical ones can be ‘improved by being broken’. I’m not sure who’s right, but on the whole I think I prefer horizontal stripes for large areas. Compare these two variations. The one with mostly horizontal stripes looks a lot nicer. By the way, I’ve put a border round my favourite in each of the following pairs of options because I’m pretty sure the pictures won’t come out side by side on all screens. So I chose to put horizontal stripes on the large triangular panel and diagonal ones everywhere else at the front. There are two possible ways to arrange the diagonal stripes, below. I think the version with the stripes almost perpendicular to the neckline is best because in the other one the neckline looks a bit awkward. The problem is that the stripes won’t be quite parallel to it. 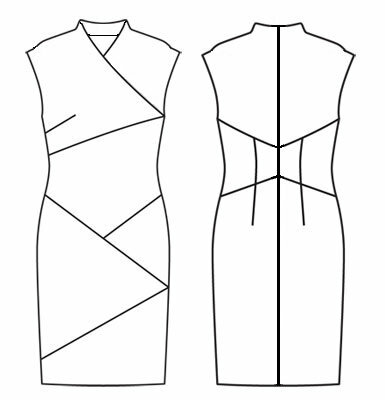 If the front of the dress has a lot of diagonal stripes then the back ought to have some as well. However I want to keep the stripes on the back skirt horizontal so as to match up at the right side seam with the large horizontal striped panel on the front. This gives these two options for the rest. There’s not much in it, but the one I’ve picked gives me a little more matching on the right side seam than the other one. My final choice is this pair. Of course now I have to get round to actually making the dress. I have some fabric (of which more another time) but there are a few things ahead of it in the sewing queue and I may well change my mind about the placement between now and then! There are many other options. All the stripe variations I’ve drawn can be found here.